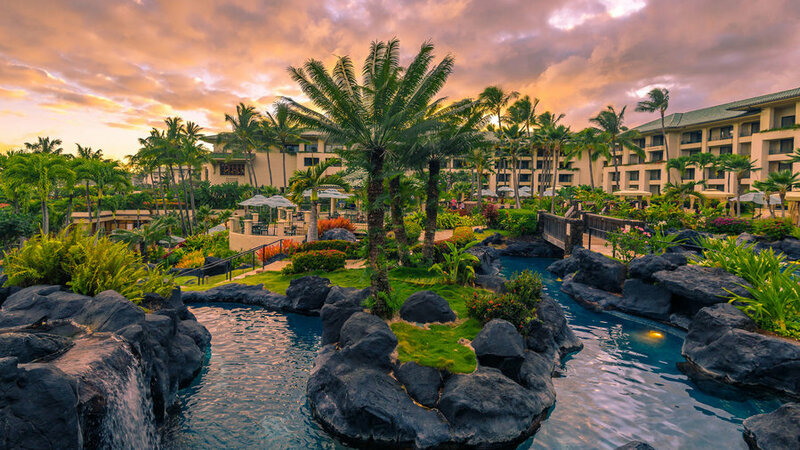 The Grand Hyatt Kauai's sprawling, multi-level fantasy pools facing Poipu’s Keoneloa (Shipwreck) Beach reflect the something-for-everybody appeal of the largest hotel on the island, which may also be the most eco-friendly. Families, couples, adventure seekers, spa lovers, golf aficionados, and volunteer-minded guests, among others, will find activities and amenities up their alley, as well as 602 rooms of understated elegance. Dusty rooms and doilies? Not a chance. “This isn’t like staying in your aunt’s guest room,” says Eddi Henry, the proprietor of this modern bed-and-breakfast. Eddi and her husband, Steven, run the 5-acre property in the hidden valley of Moloa‘a, where Eddi's son, Mychael, splits cooking duties with his mother. “It wasn’t my intent for people to be coming for the food, but they are,” says Eddi, who maintains an open-door policy for anyone who wants to come in for a meal. “Neighbors see smoke from the barbecue and next thing I know I’ll be feeding 12 people.” An Auntie Eddi menu might include an upside-down almond cake with caramelized apples and bananas, plus a tropical-fruit salad served in a papaya bowl. Or, if you’re there on a morning when Mychael is wearing the apron, you might get crabcakes with lemon aioli and a French omelet, plated with seasonal fruit and local greens. 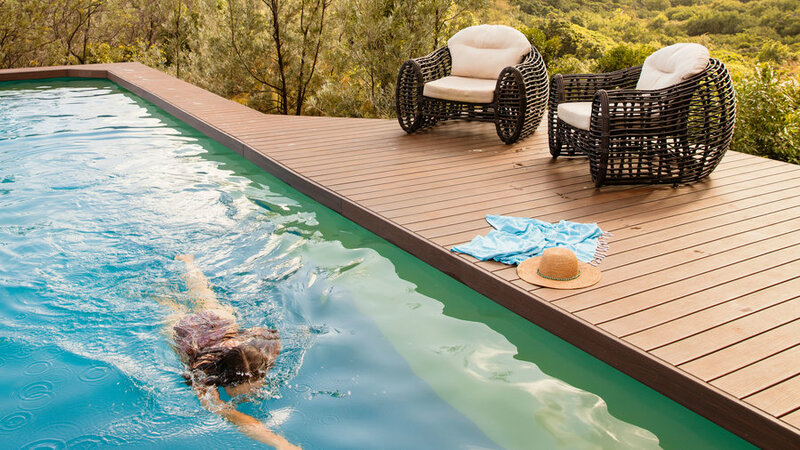 She and Mychael make a point of showing guests how to experience the best of Kauai on and off their property. 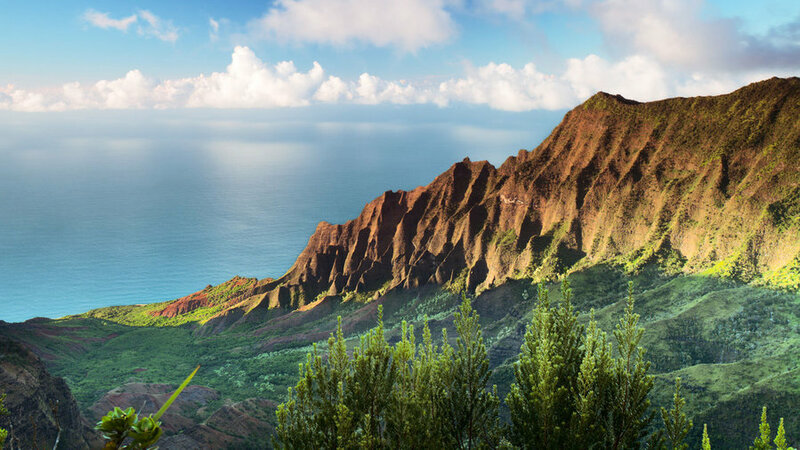 Whether they’re recommending local jogging trails, hole-in-the-wall restaurants, or a hidden beach, the Henrys send visitors in the right direction—which, on Kauai, is pretty much any direction you choose. 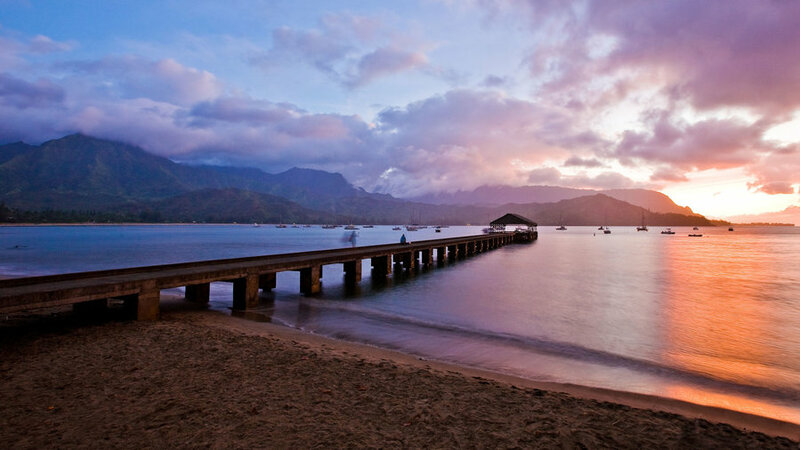 Even in a garden suite at the Hanalei Colony Resort, a small beachfront condominium complex several one-lane bridges beyond the town of Hanalei, the ocean is still close enough to hear waves lapping or crashing on the beach, depending on the season. What you won’t hear is the sound of TVs, stereos, or phones (well, not landlines). Nearby attractions such as Makua (Tunnels) Beach, Limahuli Garden, wet and dry caves, and the start of the Kalalau Trail at Kee Beach are good reasons to silence cell phones, too. More than 50 simply but graciously restored cottages and larger homes from the Garden Island’s early 20th century plantation era stand within this 30-acre oceanfront compound on the quiet West Side, shaded by numerous palms, Norfolk pines, and other tropical trees. 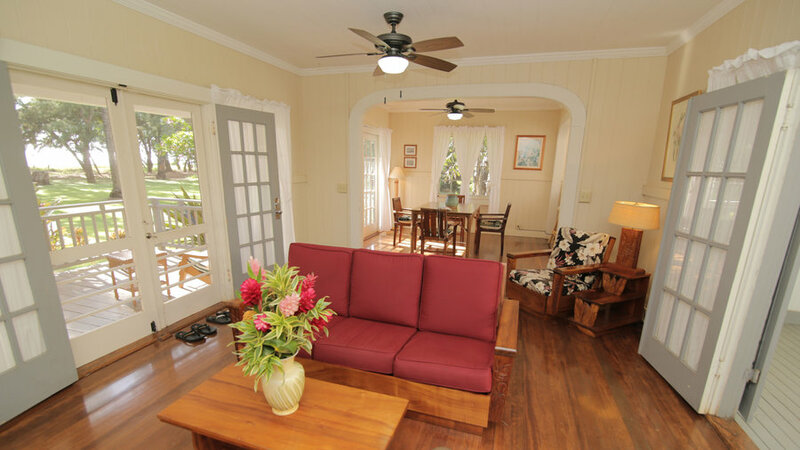 The Waimea Plantation Cottages' driftwood-lined, dark-sand beach isn’t swimmable, but guests have a head start on the winding drives to nearby attractions such as Waimea Canyon, Kokee State Park, and miles-long Polihale Beach. 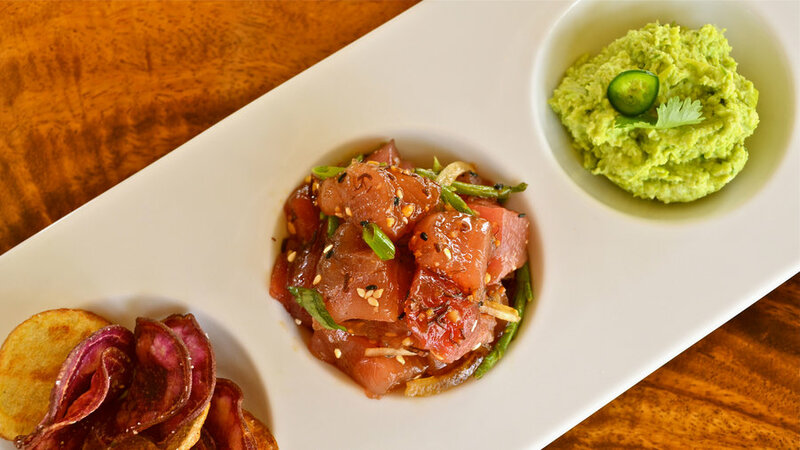 The open-air Shops at Kukuiula has been Kauai’s go-to site for gourmets since it debuted in 2009, with popular options ranging from moderately priced (Bubba’s Burgers, Savage Shrimp) to more upscale (Tortilla Republic, Eating House 1849). Hawaii Regional Cuisine co-founder Peter Merriman offers diners locally sourced choices in both price ranges: The dinner-only Merriman’s Fish House serves elegantly prepared fresh seafood upstairs, while the downstairs Merriman’s Gourmet Pizza and Burgers adds island twists to its eponymous fare for lunch and dinner. The modest storefront on a Lihue side street could be hard to find if not for the near-constant line of customers out front, waiting for a spot to open at the curving counter inside, where they can slurp the signature ramen-noodle soup, and perhaps order a piece of fluffy lilikoi chiffon pie to go. The James Beard Foundation dubbed this third-generation family restaurant an “American Classic” in 2006, and little has changed since. 2956 Kress St., Lihue. Wild chickens and the occasional cat congregate around the concrete tables at this roadside stand in lush Anahola, ready to devour any morsel diners might foolishly drop on the ground. 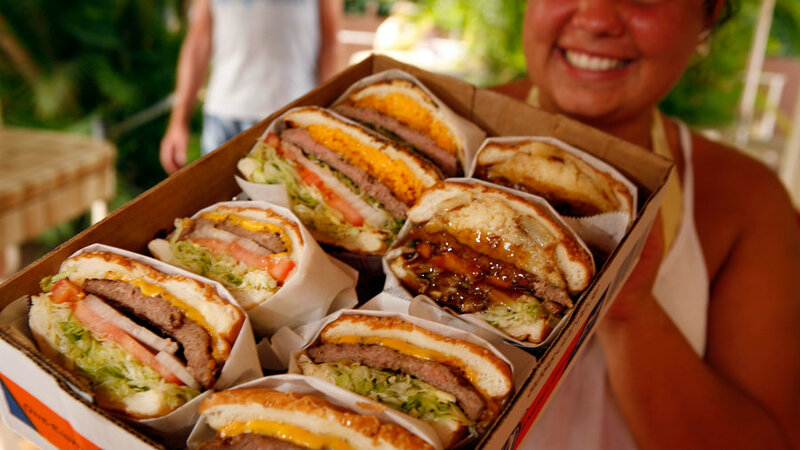 Open since 1973, Duane’s consistently earns the “ono” (Hawaiian for “delicious”) in its name with its wide variety of burgers, fries, and shakes. It’s best not to arrive starving; grab a homemade snack first at the neighboring convenience store if the line is long. 4-4350 Kuhio Hwy., Anahola. 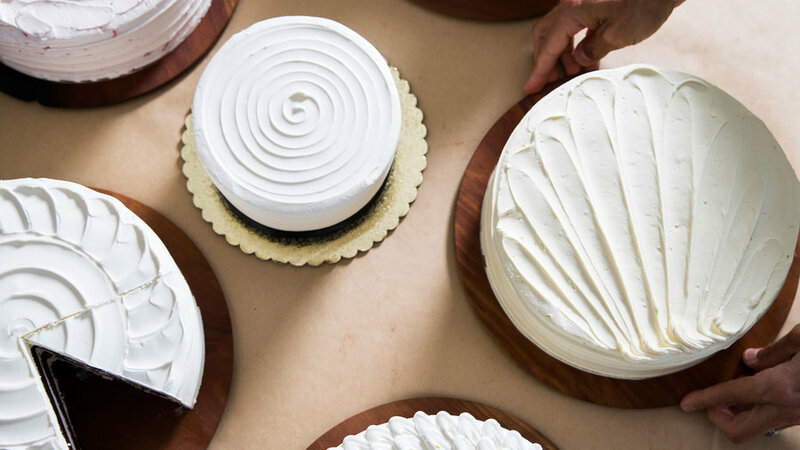 A quartet of California transplants joined forces to create Ko Bakery on the eastern-shore town of Lihue. There they churn out co-owner Chris Spinosa’s famed layered cakes and an array of tropical offerings: lilikoi-cranberry biscotti, coconut crisp cookies, Hawaiian ginger granola, and pineapple-coconut scones, plus coffee that is 100 percent Kauai-grown. As head baker, Spinosa begins his day in the kitchen at 3 a.m., using as many local ingredients as possible. There is a simple elegance to his cakes, oftentimes adorned with fresh island flowers. “Our primary focus is and always will be the taste,” Wise says. “Flavor is the driving force behind everything we do.” That and the sweet work-life balance that Ko affords this makeshift family. “We came here because of the lifestyle, where family and community come first and jobs come second,” says Spinosa. “People here work to live.” Ko Bakery is at the weekly Saturday Kauai Community Market, the first Saturday Kapa‘a Art Walk every month, and stores across the island. 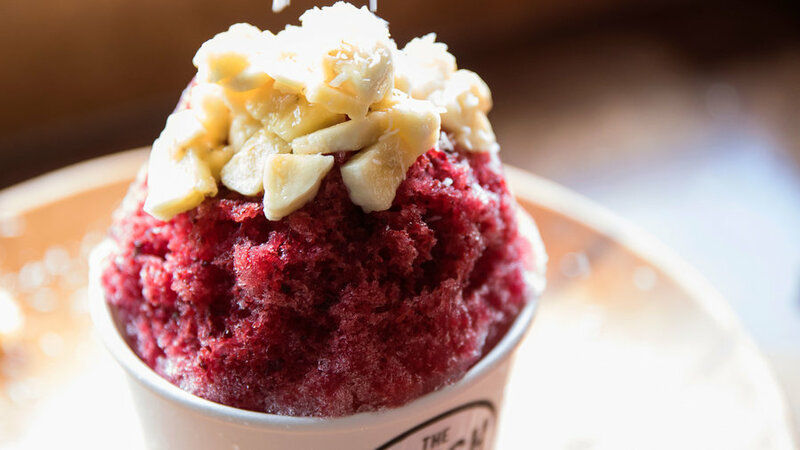 A shave ice truck that uses top-quality ingredients—think flakes of coconut, chunks of fresh fruit, and chia seeds—that also serves up its cups with playful mustache straws. With a sweet location about 10 miles west of the airport, the whole enterprise makes for the perfect first stop for just-arriving visitors. “Because of Instagram, people know about our vision, they know our kids,” says co-owner Daniel Soulé , “and they already know what flavor they’re going to order.” The Fresh Shave is parked at Warehouse 3540, a vibrant community space featuring local vendors and food trucks. 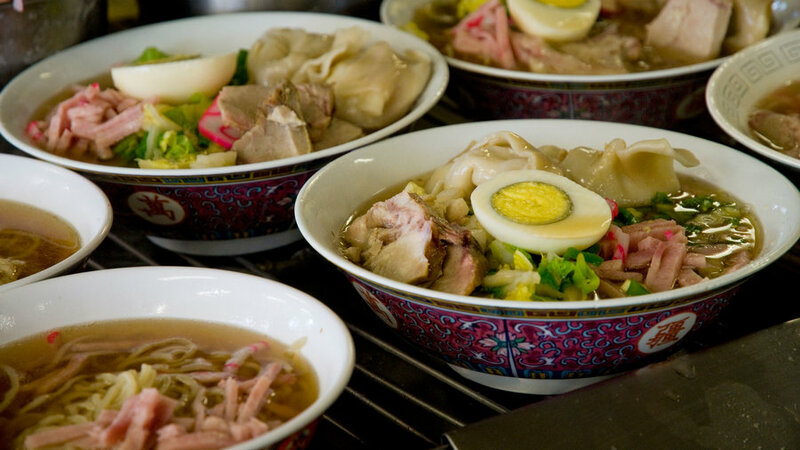 For those stuck on the Mainland, the couple opened an outpost in Long Beach, California. 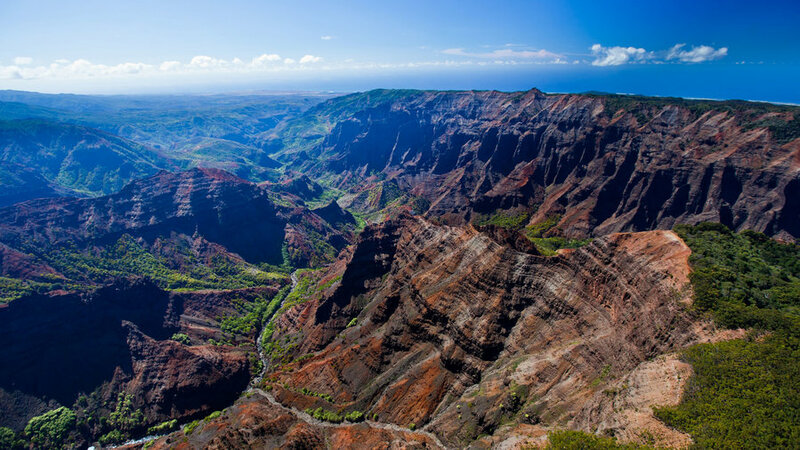 The “Grand Canyon of the Pacific” may be pint-sized compared with its Arizona counterpart, but the 14-mile-long, mile-wide Waimea Canyon nevertheless impresses with steep buttes striated in red and green, vistas that sweep from forests to the ocean, and numerous trails along the rim and down to the canyon floor. The Waimea Canyon Overlook, at mile 10 on Waimea Canyon Road, faces the two-tier, 800-foot Waipoo Falls across the canyon, while Puu Hinahina Lookout, three miles farther, brings the distant private island of Niihau into view; you can also just pull over whenever struck by the scenery. 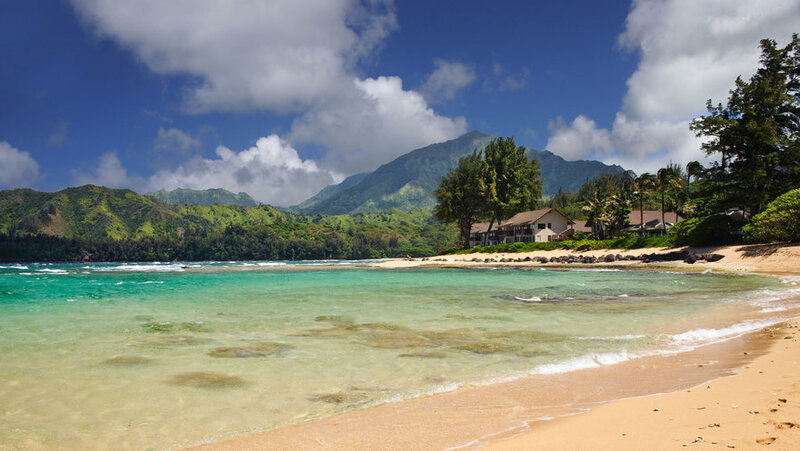 Of all the beautiful beaches on Kauai--and there are many--Hanalei Bay, near the North Shore's Hanalei Town, may be the most captivating. Framed by green mountains and lined by ironwood trees, and punctuated by an Instagram-ready pier, the 2-mile-long crescent of soft, inviting sand hosts three beach parks (two with lifeguards); in winter, surf breaks are for experts, while summer brings placid waters that turn the bay into a big pool. There are three national wildlife refuges on Kauai, but only the Kilauea Point National Wildlife Refuge is open to visitors—and has a handsome lighthouse to boot. 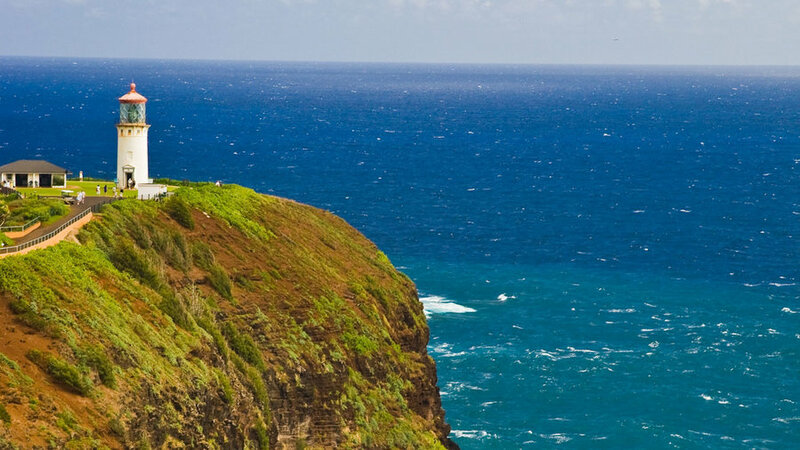 A short drive through the quaint North Shore town of Kilauea leads to a striking promontory, home to nesting seabirds, waddling nene (the endangered state bird), indigenous coastal plants, and the red-capped lighthouse, built in 1913 and recently restored; whale-watching is also an option December through May. Hanalei Surf School offers beginner, intermediate, and advanced lessons. $160/2-hour private lesson, including gear. 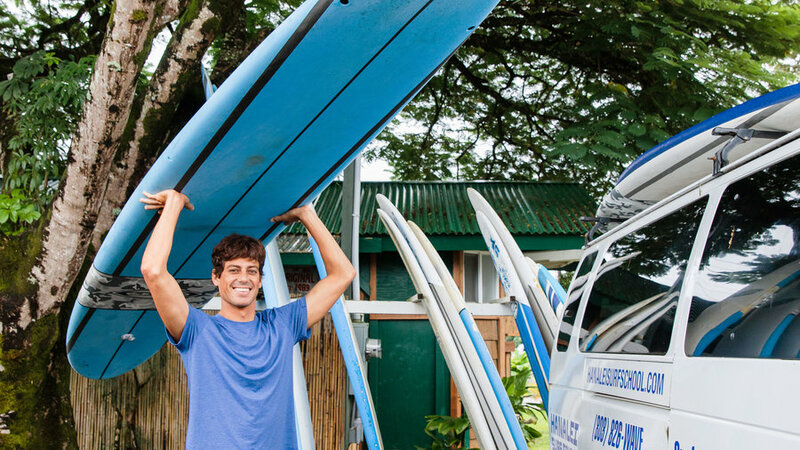 The beach break, warm water, and sound bottom make Hanalei Bay the ultimate place to learn how to surf, but it’s the personalized approach that sets Evan and Brittney Valieres’ school apart. “Everyone is stoked after a surf lesson,” says Brittney, who also teaches private yoga and stand-up paddleboarding lessons through the school. “People think it’s a big mountain to climb. But when they get proper instruction, and they see that they can do it, they are really happy. For us, sharing the aloha lifestyle is what’s really fulfilling.” The fact that Evan is a pro surfer doesn’t hurt. “I can guarantee most will get up riding on their very first lesson,” says Evan. If you had any doubt about his teaching skills: Jaya Moon stood up on a wave for the first time at age 2 1/2. 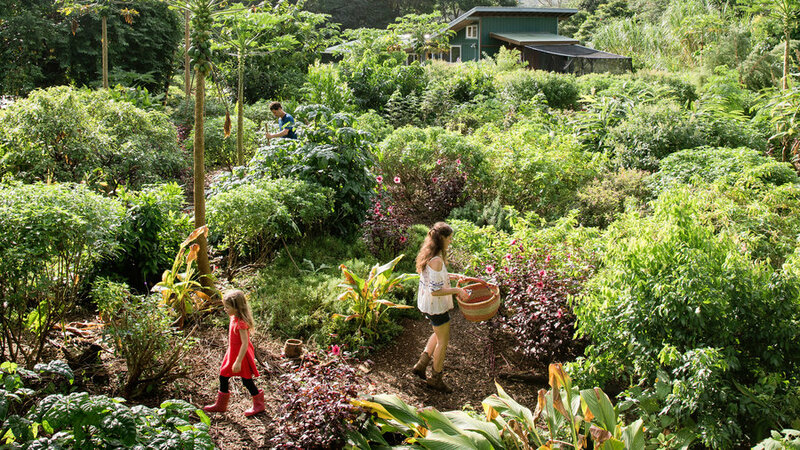 Located on the north shore in the town of Kilauea, the Kauai Farmacy is made up of 4 acres, 70 medicinal herbs, seven loose-leaf teas—and one family behind it all. Doug and Genna Wolkon moved to Kauai in 2007 after the birth of their first child and began using herbal remedies to aid their health. “Kauai empowered us with the ability to self-heal,” Doug says. The couple have taught themselves how to hand-harvest their crops, cure plants with solar dehydrators, and chop and blend everything into tea, culinary spices, superfood elixir powders, salves, and hydrosol sprays. The Wolkons run the farm with a team of 10 gardeners and herbalists, all the while raising their three children. Although the family sells most of the herbal elixers and teas at the local farmers’ market and at restaurants and health food stores, they also offer immersive farm tours. As visitors stroll the grounds and learn about the Wolkons’ perma­culture techniques, they’re encouraged to taste samples straight from the garden, from the explosively sweet fresh stevia leaf to the mouth-tingling spilanthes herb. Just as fascinating as (and much more delicious than) a helicopter tour, it’s a chance to experience the island’s legendary flora from the ground up. The farmers grow 70 medicinal herbs and make seven loose-leaf teas, five herbal culinary tea powders, two healing salves, and seasonal hydrosol sprays. Make reservations to visit the garden at kauaifarmacy.com. They also have a stand at the Anaina Hou Farmers Market in Kilauea every Saturday.